Remember that episode of Friends where Ross said something then took it back? Well right now fans of modern day Flash, Wally West, are bristling at a similar move by DC Comics, which will see plans for a Kid Flash solo series, and a Wally West back-up feature, in the ongoing book of 'rebirthed' silver age Flash, Barry Allen "put on hold". With the original line-up of Flash titles a shaky, but accepted compromise by fans, on the back of what is sure to be one of the most controversial resurrections in comics history, this latest news seams only set to rub salt in the wounds of 'West' fans who don't feel Barry's return warranted the cancellation of Wally's own book. For me The Flash falls easily within my 'top 5' - has since day one. 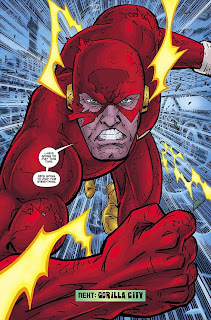 While that position is split pretty evenly among the two main legacy bearers, I feel E.I.C Dan Didio's announcement at Newsarama, to pause Wally's own adventures and state that Barry will be the Flash fix for 2010, is akin to DC running into the new decade with it's shoes on the wrong feet. Sure they still do the job, but it's uncomfortable as hell and everyone watching just thinks you're mad. Stop and swap 'em round DC - keep Barry and Wally in the spotlight in 20-10 - you'll find they fit better that way! I like both versions ofthe Flash. But the truth is, there should only be 1 lead character in the Flash book. It was a mistake to bring Barry back and then give both of them different versions of the same costume. And then to compound that by saying they'll costar as the Flash. And who will join the JLA? Hang out with GL? Barry in one panel, Wally in the next? It's just one role, and to split it amongst two people isn't the answer. I agree I don't think having two guys run around in pretty much the same gear is going to do the trick either, and I'm not sure Wally should slip into a new 'Nightwing-like' identity after all his work in the yellow boots. Still I like Barry as well, so will be interesting seeing how DC handles the bed they have made!